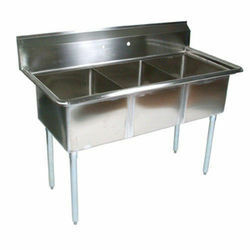 With the constant support of our expert team, we are engaged in offering a huge assortment of Multi Bowl Kitchen Sink. We are manufacturing 3-in-1 bowl sink made out of stainless steel are perfect container for food items. It’s also used for multipurpose in hotels, fast food center, restaurants and canteens. This 3 in 1 bowl sink has 3 sinks attached together for quick and easy washing and cleaning of the kitchen wares. Looking for multi bowl kitchen sink ?